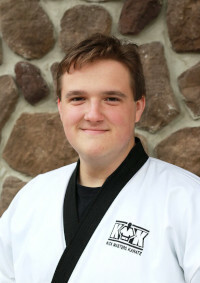 The Kick Masters Karate Studio is over 8,000 square feet in area and has many attractive features for its students. Parking is probably one of the most basic, yet convenient features at Kick Masters. Spots are always available for both day and evening classes, and are always kept free from snow and ice. A large, and extremely well lit, parking area comes in handy during and between the switching of various martial arts classes. The lobby is the entryway into our world of confident leaders. It’s designed to be a warm and inviting gateway into our state of the art martial arts facility. Announcements and special events can be easily read on the flat screen TV, while tuition fees can be paid at the oriental inspired reception desk. The spacious unisex restroom will accommodate families of little ones who need an extra hand getting ready for class. Also located in the lobby is the Kick Masters pro-shop. The pro-shop is designed to bring the latest martial arts gear to the Kick Masters athlete who needs it most. This is where students have the opportunity to see and explore new weapons, try on colorful uniforms and equipment, and purchase bags, pads, and all the other necessary attire for testing. The pro-shop will always change as new products and training apparel are introduced, giving our students the cutting edge gear to make practicing easier and fun. Inside, the main floor is covered with a 1-inch thick padded mat, which easily supports rigorous martial arts activity yet is gentle on each participant’s muscles and joints. The safety mat is broken up into nine different activity rings. The sheer size of this space allows plenty of room for various drills, equipment, weapons, and training aids, while at the same time encourages students to sharpen their skills via our training mirrors. Carpeting lines the outer rim of the main floor area, where ample seating is located for parents and onlookers to watch our motivational classes. Also, central air and central heat make training at Kick Masters comfortable and safe. Training mirrors cover most of the wall space around the main floor so each student can self-analyze each form and movement for better demonstration and display. Heavy bags, training pads, speed bags, weights, jump ropes, various weapons, and stretching machines line the outside of the padded floor for easy student and instructor access. The main training floor meshes our talented, caring instructors with eager to learn, ready to be molded, Black Belts in training! Off the main training floor are the changing/restrooms. The men’s and ladies’ restrooms were designed with the family in mind. Both spaces provide adequate, carpeted dressing areas for those quick changes before and after classes, while at the same time offering privacy by way of individual stalls. These spacious restrooms offer plenty of area for changing into gear for sparring, trying on that new uniform for the first time, or for getting focused before your mainstream exam begins. Showers are also available to those in our adult class, and/or in select adult programs. One of the most convenient features in the Kick Masters facility is the private office. Off limits to eager students, the office offers parents and students an opportunity to visit with, ask questions, or discuss issues with Senior Black Belts ready to provide expert advice. Equipped with modern technology, the Kick Masters office acts like an ‘information hub’ by storing student records, curriculum, offering Black Belt Internet access, and by housing the newest martial arts business software. It also offers privacy for anyone with a personal and delicate matter, or for new student interviews. Because younger siblings have shorter attention spans and have trouble containing their energy throughout an entire class period, a special space has been created for them. The Parent Lounge offers parents the opportunity to accompany their ‘little one’ into this pre-school oasis where toys, puzzles, games, etc. await them to make their time at Kick Masters more enjoyable too. The most convenient feature of this room, other than the flat screen TV, is the ability to observe the current class while supervising the younger children. This way they are not a distraction, and parents can still feel like they are involved in the class! If it so happens there are no young children in the room, parents can use this space to read a book or magazine, balance their checkbook, make a phone call, or even ‘rest their eyes’. Our private lesson/birthday room was an absolute necessity. This room offers the space necessary for private lessons in sparring, katas, basic kicking, techniques, self-defense, ground grappling, and anything else related to the martial arts. Most of our Black Belts offer half-hour lessons throughout the week to help polish a student’s physical skill on a one-on-one basis. On the weekends, this room is available for karate birthday parties, a favorite among our youth. Karate Birthday Parties are a great way for Kick Masters students to have their friends participate in a structured karate class setting along side of them, while showing off their new dojo, their fun instructors, and of course their martial arts talent and knowledge. The Black Belt Room is a unique feature of the Kick Masters studio, specifically created for our staff. Those who have achieved this prestigious rank in our program deserve a separate area for changing, storing personal belongings, and “gathering thoughts” before teaching a high-energy class. This serves as our instructors’ headquarters as schedules, announcements, information, protocol, and the latest training DVD’s for Black Belts are viewed in this area. The cardio room is exclusively available to Kick Masters parents enrolled in our “Cardio Club” for a nominal monthly fee. Start walking on the treadmill, bike the trail without worring about the weather, or climb up that killer mountain to become a lean, mean, healthy machine. Become as fit as your children or just lose an extra pound or two. Either way, let’s all get ‘our workout on’ together. Flat screen TV’s line the walls to keep you motivated on your simulated runs along side Rocky Balboa. Or, just plug in your ipod and burn, burn, burn! Anyway you slice it, Kick Masters Karate is definately a state-of-the-art facility ready to make you feel welcome!